Ireland commits Economic partnership with Liberia in Agricultural and large Scale Productions. Ireland commits Economic partnership with Liberia in Agricultural and large Scale Productions, the commitment for partnership comes in the wake of several bilateral meetings when Foreign Minister Gbehzohngar Milton Findley met with the Irish at the AU and EU first annual joint ministerial meetings in Brussels, Belgium. The EU-AU ministerial meeting was an opportunity to take stock of the implementation of the outcome of the 5th AU – EU Summit (Abidjan, 29-30 November 2017), with a key decision to invest in Youth through market-responsive education by rolling out more vocational training and other educational programs. At the meeting, Foreign Ministers were expected to approve a Communique on the implementation of joint initiatives through Economic Cooperation, Resilience, Peace, security, and Governance, Migration and mobility, Cooperation on the Global scene and as well as a Post 2020 commitment while taking account of regional specificity and ensuring congruence of a future partnership. 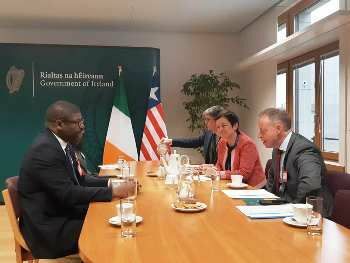 During his meeting with Ireland Minister of State for Diaspora and International Development Ciaran Cannon and Fionnuala Gilsenan, Director of Africa unit, Foreign Minister Findley discussed strengthening of Ties and Irish interest in establishing a full Mission in Liberia. According to a Foreign Ministry release, Minister Cannon expressed commitment for Economic partnership with Liberia in the Agricultural and large Scale Production sectors. Minister Cannon further emphasized the need for Youth empowerment through Agriculture programs in the interest of both Liberia and Ireland..
For his part, Liberia’s Foreign Minister Gbehzohngar Milton Findley expressed gratitude to the people of Ireland for committing to partner with the government of Liberia especially desiring to collaborate on agriculture front. He assured the commitment of President George Manneh Weah in further strengthening ties with Ireland in ways that would support the country’s Pro-Poor Agenda for Development and Prosperity.